Planting Dates: Plant seed or root tubers of perennials such as Jerusalem artichoke in the spring after the last frost. Planting Method: Plant seed or tuber pieces in well-drained soil in full sun in the spring. Seed Emergence: Both seed and tubers emerge quickly to grow into large plants. Harvest Time: Harvest the flower petals any time, the seeds after the flower heads have matured and dried, the edible tubers in the fall. Spacing: Seeds should be planted 18-24 inches. Clumps of perennial at 18-36 inches. Growth Habits: Tall-growing and coarse for the most part. Maximillian is the most refined looking and often the best choice for residential gardens. Culture: Plant in well-drained soil and fertilize monthly for the largest flower heads. Soil amendments are not that important for sunflowers. Troubles and Solutions: Too large and coarse for many residential locations. Solution: don’t plant them there. The perennials spread and can become invasive. Harvest and Storage: Harvest the flower petals any time to use as an interesting garnish. Gather and eat the mature seed after the flower head has dried. Varieties: The common sunflower is Hedera annua. Maximilian sunflower (with edible tubers) is Hedera maximilian. Sunchoke or Jerusalem artichoke is Hedera tuberosa and has the largest edible tubers. Notes: The tubers of Maximilian and Jerusalem artichoke taste like water chestnuts. They are delicious and can be used just like potatoes. 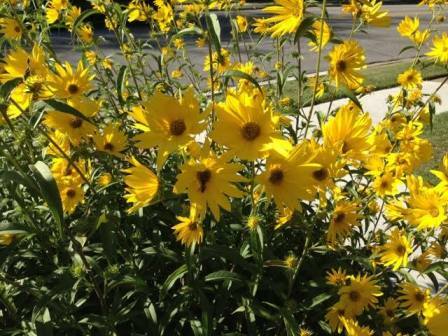 Maximilian sunflower is an excellent landscape perennial. HABIT: Helianthus annuus is the annual common sunflower. Helianthus multiflorus is a perennial. 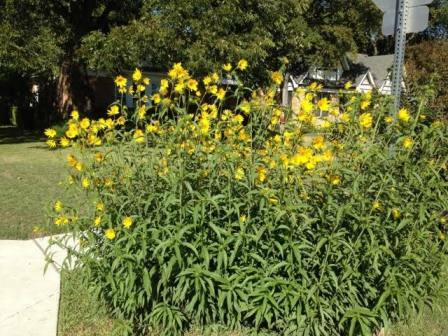 Helianthus angustifolius, swamp sunflower, likes wet soil. Helianthus maximilianai is Maximilian sunflower, a beautiful clumping perennial that blooms from August to October. Helianthus tuberosus, Jerusalem artichoke or sunchoke, is a 6’-8’ perennial grown for its edible underground tubers that taste like water chestnuts and are used as a potato substitute. Make sure you want it before you plant it – it spreads easily. Culture: Plant seed or tubers in any well drained soil in full sun. Fertilize monthly for the largest flower heads. I recommend it for the lazy gardener’s garden. Dig the tubers in the fall after the tops have died. Mexican sunflower is Tithonia rotundifolia. Uses: Food, summer color, bird attractant. Problems: Too large and coarse-textured for many small gardens.